Spoonflower Bootcamp: What is a Hex Code? Computer monitors display millions of different colors. Since a blue color may be called teal by some and turquoise by others, there has to be a way to describe colors without being so subjective. In today's Bootcamp post, we're exploring hex codes – a combination of six numbers or letters that identify a specific color. Hex codes are often used in design software like Adobe Photoshop, and our Color Changer tool uses them too. 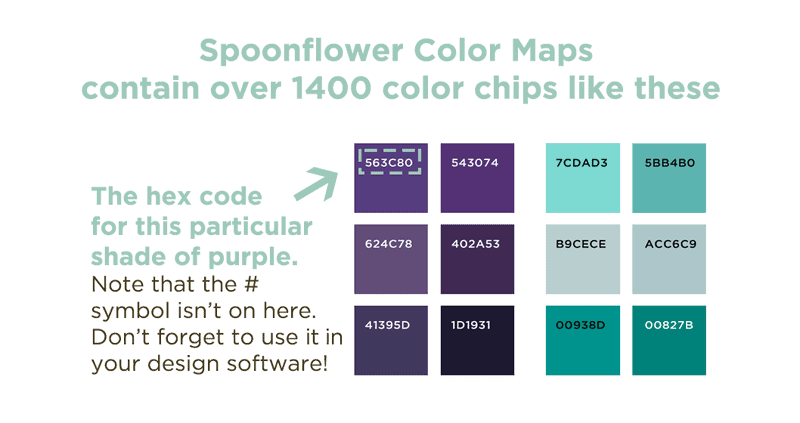 Spoonflower color maps have their corresponding hex codes listed within each color chip as an easy reference. Color maps can be printed onto any of fabrics and wallpaper, so you’ll know what a specific hex code will look like on that particular substrate.